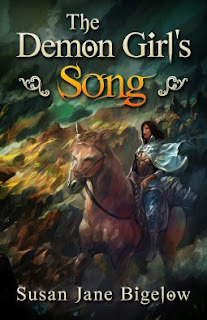 I won my copy of The Demon Girl's Song in an awesome prize bundle I received when I attended the Facebook release party. I'm not sure why I chose to read it first. Perhaps the title intrigued me as it promised a binding of darkness, innocence and beauty. I was not disappointed. The Demon Girl's Song was a lovely combination of many things. History, magic and gender expectations to name a few. Andín comes to us with her heartfelt desire taken away. She's quickly stripped of everything else she's given to take the place of her dream of university. I really liked that Andín didn't choose to love the person she did 'because' of the demon or anything else. She loved Yshe because of the people they were. Andín's journey, both in travel and self discovery, is touching, adventurous and empowering. For all the action, danger and fear she experiences in her travels, she's a wonderful character. She's strong, gentle and loves so much. Bigelow has a delightful hand for crafting such a bold story. The scope of her many-countried land balances nicely with its comprehensive but not overwhelming history. Very much recommended.